Great job to both soccer teams! 6 good games on Saturday. Very tough competition. 3 injuries... Thankfully Gustavo did not need stitches , but Adnan did have to go to the hospital , but he turned out ok. Thank you Lord for watching over our team. We still have one more game today. It's been great fun to coach and watch the guys play. Go Eagles! HS plays at 12:30. Be there at 12. No Sunday games for the elementary team. The outlook wasn't brilliant for the Mudville nine that day: The score stood four to two, with but one inning more to play, And then when Cooney died at first, and Barrows did the same, A pall-like silence fell upon the patrons of the game. A straggling few got up to go in deep despair. The rest Clung to the hope which springs eternal in the human breast; They thought, "If only Casey could but get a whack at that— We'd put up even money now, with Casey at the bat." But Flynn preceded Casey, as did also Jimmy Blake, And the former was a hoodoo, while the latter was a cake; So upon that stricken multitude grim melancholy sat, For there seemed but little chance of Casey getting to the bat. But Flynn let drive a single, to the wonderment of all, And Blake, the much despisèd, tore the cover off the ball; And when the dust had lifted, and men saw what had occurred, There was Jimmy safe at second and Flynn a-hugging third. Ten thousand eyes were on him as he rubbed his hands with dirt; Five thousand tongues applauded when he wiped them on his shirt; Then while the writhing pitcher ground the ball into his hip, Defiance flashed in Casey's eye, a sneer curled Casey's lip. And now the leather-covered sphere came hurtling through the air, And Casey stood a-watching it in haughty grandeur there. Close by the sturdy batsman the ball unheeded sped— "That ain't my style," said Casey. "Strike one!" the umpire said. From the benches, black with people, there went up a muffled roar, Like the beating of the storm-waves on a stern and distant shore; "Kill him! Kill the umpire!" shouted someone on the stand; And it's likely they'd have killed him had not Casey raised his hand. With a smile of Christian charity great Casey's visage shone; He stilled the rising tumult; he bade the game go on; He signaled to the pitcher, and once more the dun sphere flew; But Casey still ignored it and the umpire said, "Strike two!" The sneer is gone from Casey's lip, his teeth are clenched in hate, He pounds with cruel violence his bat upon the plate; And now the pitcher holds the ball, and now he lets it go, And now the air is shattered by the force of Casey's blow. Oh, somewhere in this favoured land the sun is shining bright, The band is playing somewhere, and somewhere hearts are light; And somewhere men are laughing, and somewhere children shout, But there is no joy in Mudville—mighty Casey has struck out. This wasnt how the boys game went but it was very similar. The boys ended up losing 18-2. The bats were not swinging as well as the last game and the defense was a little lax. They played hard in the rain and wet grass. They played their hearts out and never gave up. The next opportunity to play will be this Wednesday, March 27, 2013 at 4:00 PM. The girls had another game on March 23, 2013. It was in the afternoon so they were a little sleepy and it took them awhile to wake up. When they woke up their bats woke up too and they managed to score 8 runs. EAB was too much too handle though and they scored 24. It was a nice sunny day to play softball with friends and family. Their next game should be Thursday, March 28 at 4:00 PM. Next game they will be ready to play and looking to give their best effort. All games will be at School of the Nations. Click on the link below to see our soccer tournament schedule. The elementary team is in the category "sub 12" , and the JH/HS team is on the category "futsal" on the last page. Please remember to bring a photo id with date of birth to the tournament. Every player needs an id to check in to the tournament. Also remember to bring you shin guards. You must have this safety equipment in order to play in the tournament. 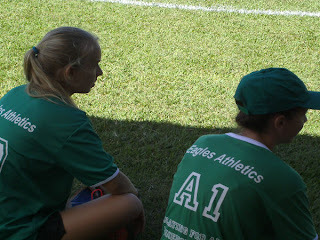 There are six teams in the sub 12 category (BIS, Nations, Cougars, Boca Juniors, Fluminense, Ajax), divided into two groups. We are in group A, and we'll play two games on Saturday. If we qualify we'll play again on Sunday. Sunday, 12:30h BIS vs Ajax. It was a cloudy overcast day at the EAB sports complex. It was a great day for a softball game. The other three games hadn't turned out the way the eagles wanted but they were confident going into this game. The stadium was crowed and there was standing room only as the fans were ready for game four of this epic showdown between EAB and BIS. The eagles came out strong and scored 2 quick runs in the first inning. The bulls were not going to be denied and scored 2 runs in the bottom of the 1st. The girls came out focused on hitting and scored 3 more runs in the top of the 2nd. With some great defense from the outfield they stopped the bulls and held them to 0 runs. In the top of the 3rd the eagles bats were quiet as they could not score any runs. EAB came out swinging and scored 2 runs in the bottom of the 3rd. The eagles were up 5 to 4 going into the top of the 4th. The pitching and fielding were too good and they didn't manage to score any runs. The bulls came out hitting and loaded the bases with no outs. The batter came up to the plate facing Priscilla. She starts her windup and throws the pitch. She hits it high in the air, the outfielder is going back, going back, and she just misses the ball my an inch. 3 runs came into score and then they managed to score 3 more. The eagles go into the top of the 5th with one last chance to tie the game. They were down 10-5. 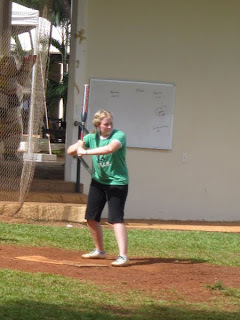 Mwango comes up to the plate. She stares down the pitcher. The pitcher throws the ball. Mwango swings its going high and far. The girl goes back, back, back, and she cant make the catch. It goes over her head. Mwango is rounding 2nd with a full head of steam. She is going for home. She makes it into home base easily with a inside the park home run. The crowd is going wild and giving her a standing ovation. After that the girls emotions were drained and they couldn't score any more runs. The final score ended with EAB 10- BIS 6. It was an outstanding game with the fans never sitting down because of the excitement. Mwango went 4-4 with 3 RBI's. She was the player of the game. Anna and Abbey were named the defensive players of the game. The infield did a great job of working together and talking to eachother. The outfield did an outstanding job of catching and not letting any balls get past them. The girls hustled and did a great job of never giving up and keeping their heads in the game. Stay tuned for the next sports report. The boys had another battle with EAB today. We only had 8 players but it was more then enough. They boys started off the game scoring two runs in the first inning., EAB answered back with three runs in the bottom of the first. BIS scored two more runs in the 2nd inning and held EAB to 0. In the 4th inning BIS scored four more runs and led 8 to 3. EAB answered back with some timely hitting and scored three runs of their own. It stayed close until BIS went ahead 12 to 8 heading into the bottom of the 7th. EAB came out swinging and scored 4 runs to tie the game and we went into extra innings. In the top of the 8th BIS scored 2 runs and went ahead 14 to 12. All they had to do is get three outs and they won the game. EAB came out swinging and scored 3 runs so the final score was 15 to 14 in favor of EAB. One of our players had to leave in the bottom of the 8th so we only had 7 players. It was a great game and the boys showed a lot of improvement. Ben was the player of the game with 6 RBI's and a inside the park home run. Gustavo and Jesse were the defensive players of the game. Zeeshon did a great job pitching. 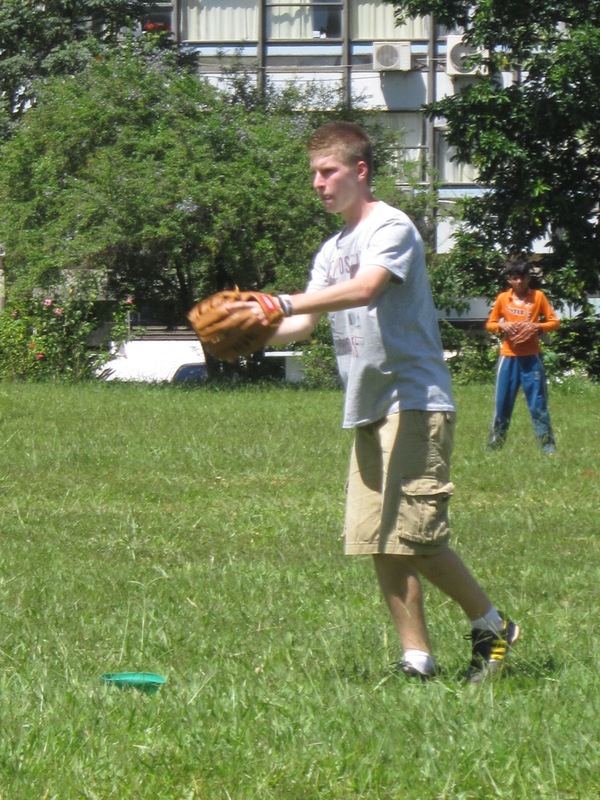 Letsie did a great job in the outfield and with his strong arm kept them from scoring more runs. Alan had a great catch in the outfield as well. For only having 8 players and keeping the game close was a great accomplishment. They did not have a practice since the last game so it was a great effort by all the players. 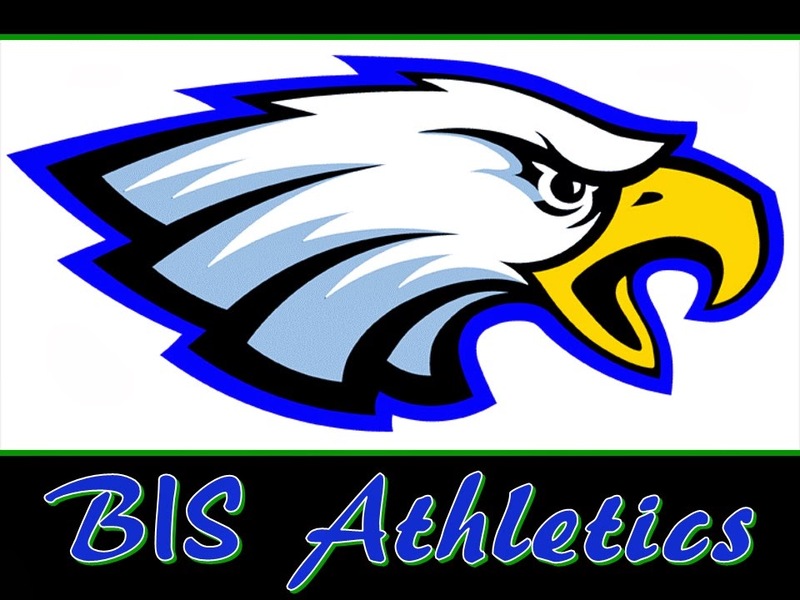 The next game will be Friday, March 22 so stay tuned for the latest sports news from BIS. 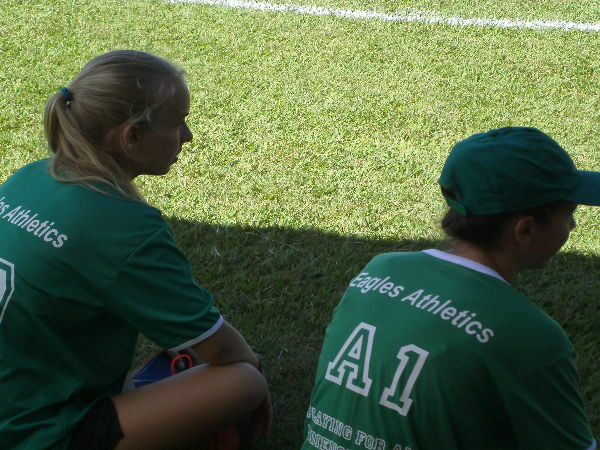 The girls had another game against EAB on Saturday, March 9. The girls started out the game very well and scored two runs in the first inning. The EAB girls answered back with four runs of their own. The game went back and forth for a couple of innings. The EAB girls came out strong in the bottom of the 4th inning and scored a lot of runs. Our defense wasn't the greatest but with a some great plays we got out of the inning. The final scored ended EAB 23 BIS 7. Not as good as the last game but they are improving every day. 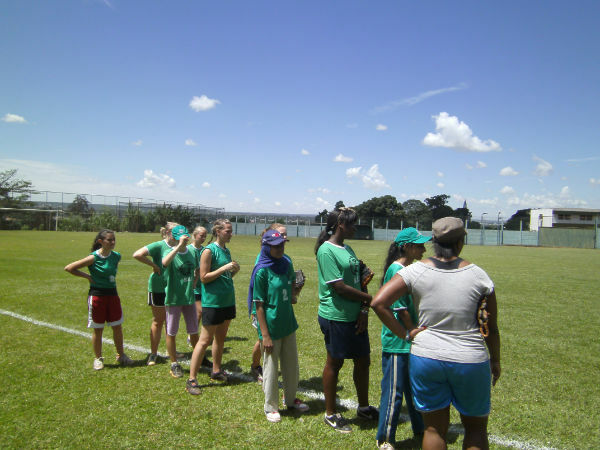 This was the first game where all the girls showed up. With a little hustle and determination the girls will be ready for the next game. Mwango had a couple of nice hits and was named player of the game. Stay tuned for the next game. The girls had their first game of the year on February 7. The girls were excited to play again. They got a little bit of experience last year but now it was a brand new year and they were ready to play. They had been practicing for about 2 weeks and they had gloves and balls to practice with. Last year we practiced with tennis balls and our bare hands. They were playing the other American school called EAB. They started batting and they got three quick outs. The EAB girls went up to bat and scored 6 runs in the inning. It was a rough game for our first game of the year but the girls played hard and kept great attitudes. The final score was 18-1 but you could see the skills were there. February 23 This was the date of the next game. The girls had went to bed early and gotten a good nights sleep. They woke up early and at a hearty breakfast. They started the first inning scoring 6 runs. The EAB girls managed to stay even and score 6 runs of their own in the bottom of the first. They traded runs back and forth the next six innings. The final score was 12-12. Their was another game scheduled so we could not go into extra innings so it ended as a tie. The girls improved tremendously. 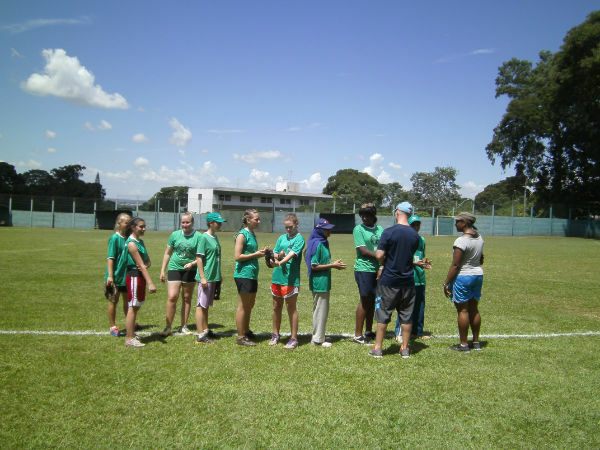 Their was great defense by Sarah and Mwango. Great pitching by Priscilla. Great hitting by Mwango, Amna, Aeysha, and Janelle. 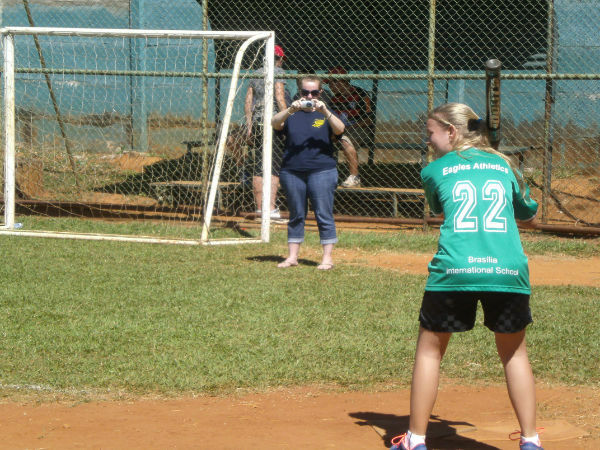 Sarah Bastos did a great job in the outfield. Ana came for this game and played great defense and hit the ball really hard.The girls are looking forward to their next game so they can see their skills improve. 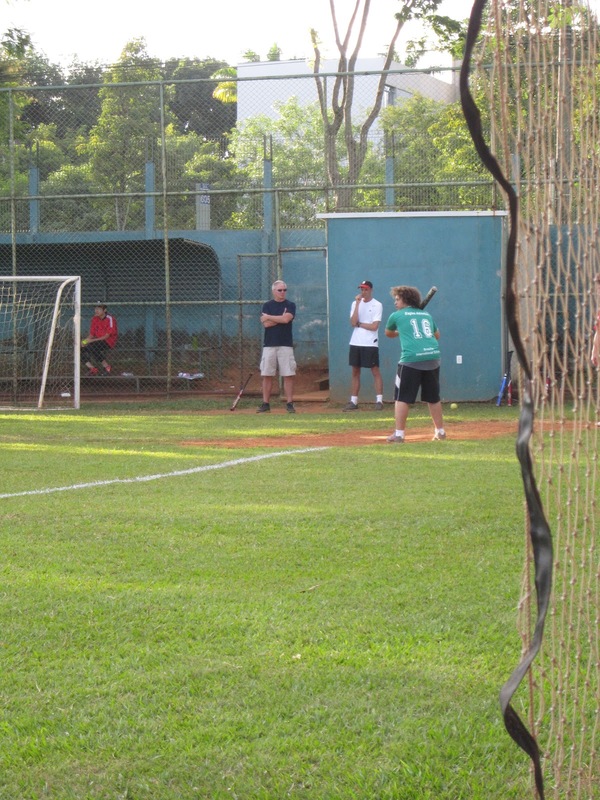 The boys had a softball game on February 22 against EAB. The first two innings didn't go that good and EAB scored 12 runs. The boys settled down and the final scored ended 18-4. It was the first game for a lot of the players but they did excellent for only 3 practices before the game. Their is some tremendous talent on the team. Jesse is extremely fast in the outfield and had a couple of great catches. 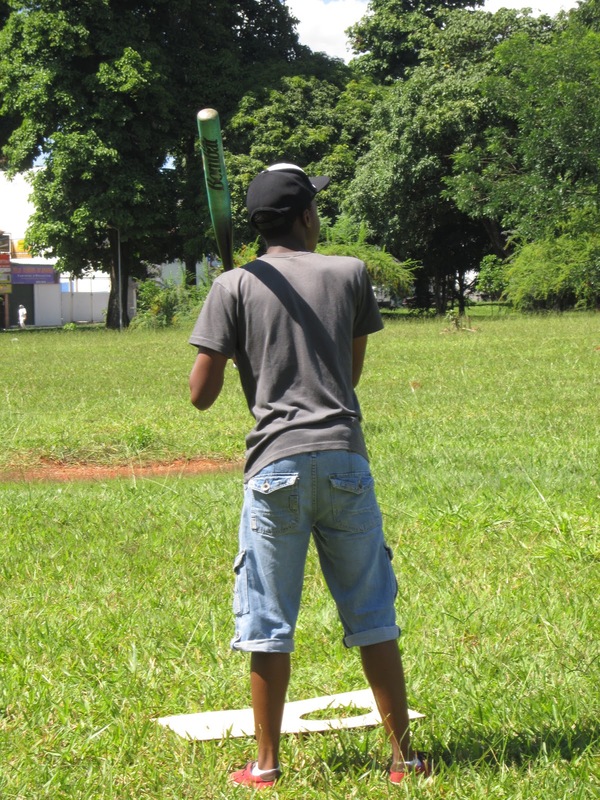 Gustavo is still learning first base but he will be a great first baseman. 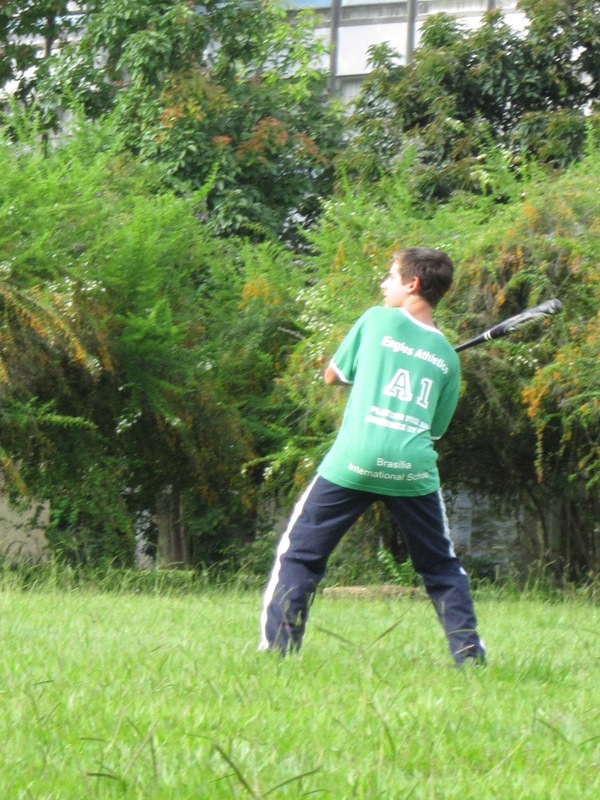 David did a great job pitching and hitting. Zeeshon can bat very well and is a very good fielder. It was Huat Tharts first game but he showed great athleticism and knew where to be on the field. Goru was the shortstop and he was all over the field catching balls and throwing people out. 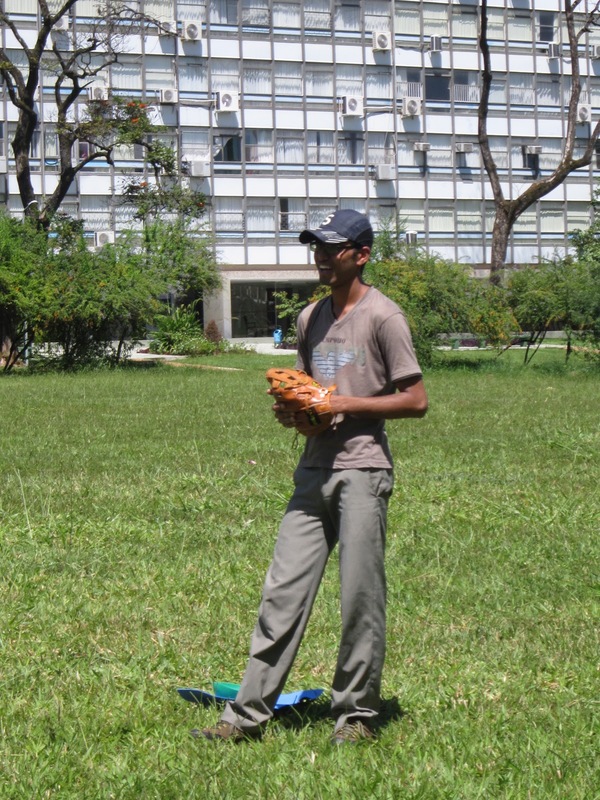 Frizald started out being catcher and showed his athleticism by making a great catch on a foul ball. It was a good first game and their is lots of room for improvement. 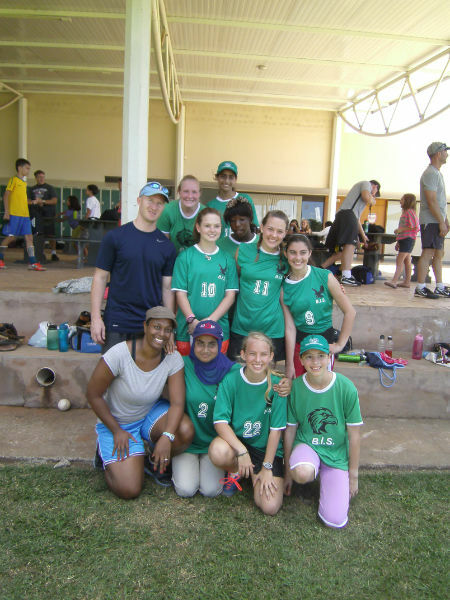 With dedication and hard work they can become a very good softball team. 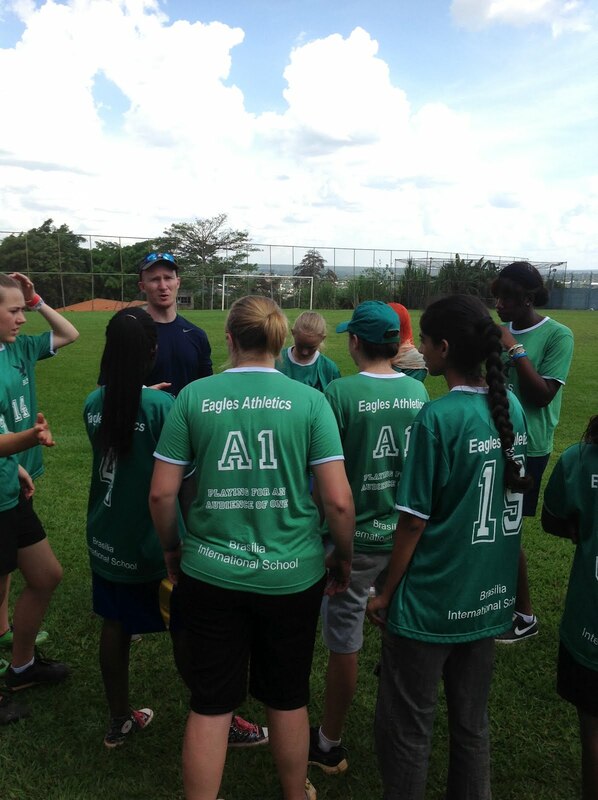 The boys had their 2nd game against EAB. It started out very good by scoring 2 runs in the first inning. EAB answered back with 5 runs in the bottom of the first. They extended their lead in the 2nd and 3rd innings. 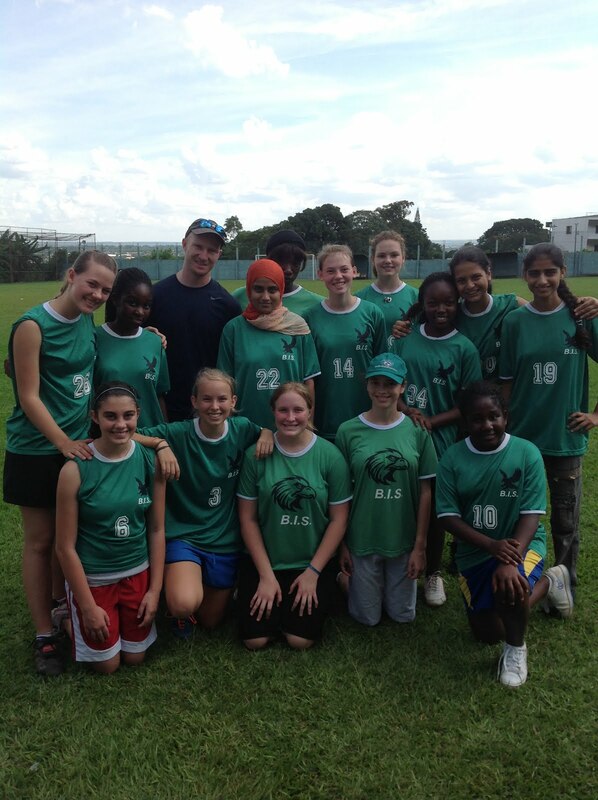 The final score was 23-4 but there was lots of improvement from the first game. We had two new players in Kwame and Ben. Kwame did a great job in the outfield and Ben was a hitting machine and had a beautiful catch. With a little more practice they will be hitting on all cylinders come the next game. Frizald had a great catch on a foul ball that looked a lot like Derek Jeter. Zeeshon pitched for a couple of innings and was looking like Justin Verlander. Next game they will be ready to play and come out with a victory. It was a great effort and everybody played hard and had great attitudes. 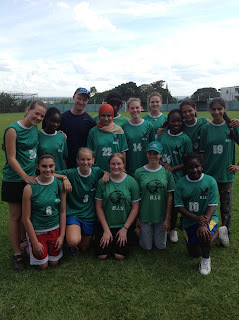 The HS and MS soccer teams kicked off the season with a tough game against the Teachers and Parents. Ms. Lancaster and Mr. Knutson lead the teachers and parents to beat the students 6 to 4. Mr. Owsley and Mr. Manning were the key players for the Parent's team, while Allan, Andrew and Kwame scored the goals for the BIS Eagles. More exciting games coming up soon... Go Eagles!!! The 3rd - 6th grade soccer team beat the teachers and parents 5 to 4 last Saturday. The Eagles were losing on the first half, but they got it together and turned things around for an exciting win on the second half. Way to go Eagles! !